Starting off as a fashion designer, she became a professional aroma therapist and began teaching aroma therapy. After various experiences in her life, she happened to get inspired to produce a film so as to fill the universe with gratitude and that being her mission in life. She did everything such as shooting, interview, editing video, writing a song for the ending song and singing it herself to create the film. The title is “The Miracle of the Gifted Quarter – Life’s Truth revealed”, which contains many scenes in which Katsuko Yamamoto, a teacher at a special-needs school, communicates with students. On the National Human Rights Day in 2013, “The Miracle of the Gifted Quarter” got played at the headquarters of the United Nations in New York. In total, the film has been played at 1800 places in 18 different countries and has reached 180,000 viewers. 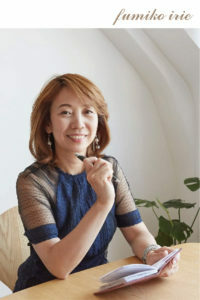 She has also released her own books “The Miracle of the Gifted Quarter, Life’s Truth” on Sangokan Publication and has also collaborated with A children’s book author Nobumi on a picture book “Oheso No Saki” and “Giving Creates More?” on Shichida Education Publication. In 2014 she released her second book “Hesodo~ Taking a Look Into the Universe~ Finding a Mission” also on Sunmark Publication. Do you really think you know your true self? Hesodo is way of life that deepens your relationship with your true self, which is something you live with throughout your whole life. By seeking yourself in the present, you begin to see your future. By being aware of where you are, you will find the answers to your problems from yourself, which will make it easier for you to be able to trust yourself and be happy in your life. What this workshop is aiming for is to enlighten and grow your skill of instinct/ intuitions. Deepening your instincts and intuitions will give you another essence in to your life. By doing this you also begin to recognize who you really are and what you really are. It is designed for the participants to experience all these things. Sharpening and deepening your true intuitions and instincts can be incorporated to your job, your daily life, and social activities. It will also help for people who are learning physical therapy, counseling, yoga, massage, etc. You would be able to see your abilities in those things go up. To live a mission means to enjoy your life as much as you can while being your true self. By deepening your relationship with yourself and knowing who you really are, it will lead to happiness and that will lead to you mission in your life. Please, connect with your intuitions and enhance your life. The reason is that, hypothetically, when you become conscious about your existence and being, your brain waves become consistent to a certain frequency, which is 7.8 Hz. That means scientifically, brain stem and basal ganglia becomes active in such way that creates some kind of connection to space, which is shown by the frequency levels measured that the brainwaves are letting out. Neurologically, 7.8Hz is a frequency of an energy quantized in an atomic level, and is also a frequency of electromagnetic waves that contain information of outer space. It also connects to a fact that in 1952, a German physicist Erich Schumann proved that the frequency of the ionosphere that surrounds our planet 7.83Hz. Some scientists also believe that the vibration of the magma on earth is 7.8Hz. So if you were to be a radio or a TV for example, if you channel yourself to 7.8Hz with the idea of Hesodo, your brainwaves are channeling into a frequency which contains the unknown information about the universe. It is interesting that even in a neuroscientific aspect, Hesodo can create some connection with what is out there in the universe. The film “The Miracle of the Gifted Quarter” is produced mainly through interviews with Kakko-chan, Katsuko Yamamoto, who is a teacher at a special-needs school. It contains many scenes in which she communicates with students, whom she calls her friends. Fumiko Irie, the director of the film, was in difficult situations, when she had an experience which forced her to create the film. It was that gratitude came out from herself when she admitted herself as she was. While she had no filming career, she had a firm emotion to create a film “to swell the gratitude in the universe.” She run with her small camera for home video and completed the film. The film deeply touched audiences and they could remember to cherish lives and to love themselves. It turned out incredible number of non-profit screenings. Over 180,000 people have watched the film not only in Japan, but it spread across the oceans to USA, Australia, India and China etc, sixteen countries in total. It was invited to Japan Film Festival in USA, on the air by UTB, and received a standing ovation at a screening in Columbia University, which is the summit of video technique. It’s message reached across borders of countries and cultures. We would like to share the delightful impression with as many people as possible. We also desire to realize Yukie-chan’s wish. Yukie-chan appears on the film and a girl who died from an intractable disease. The wish is to have everyone know that impairments and diseases are important and to make a world where all know that everyone is unique and precious. Please have a non-profit screening by yourself. Subtitles : Both Japanese and English are available. in Shimokitazawa Tokyo from February 1st to July 10th, 2009. Screened for Japan Film Festival Los Angeles 2008 on April 13th, 2008. On the air by UTB (Local TV in Los Angeles) in August 2010. A teacher of a special-needs school in Ishikawa Prefecture, Japan. She calls her students as “precious friends”. Many stories of their heart-warming relationship touch people. She gives talks in Japan and overseas, and is also busy for many issues like writing books. 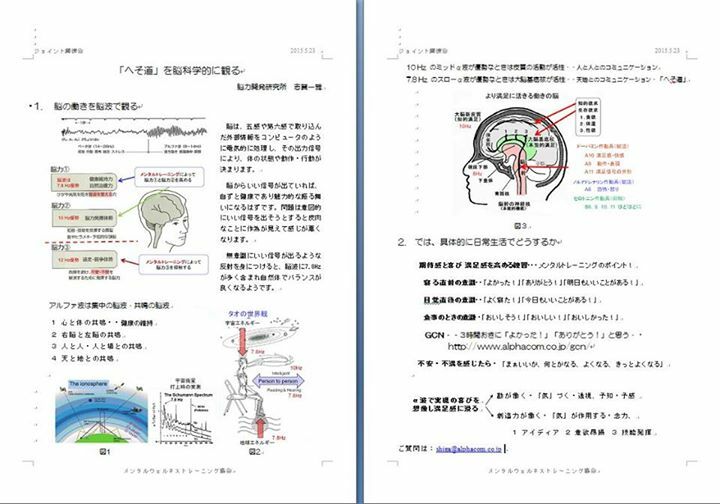 After Mr. Toshiya Miyata, her colleague, collapsed by brain-stem hemorrhage, she came to know that many people cannot communicate from impairments and accidents. While she is helping Mr. Miyata for his rehabilitation, she sets forward many activities to support those people communicating; To open a webpage providing information of hardware and software for those people, and to produce “Ohanashi Note” which is a handmade book containing illustrations to use for communication. When a person fully accepts oneself, he or she will be filled with gratitude. Gratitude is not an act that is done to someone or something; rather it is a feeling that originates from one’s heart. I realized this simple truth a few years ago while praying. I was praying from the bottom of my heart not to live for my ambition, but for my mission. I could not help sharing the excitement of this discovery with as many people as possible. In order to help foster a sense of gratitude in the world, I decided to create a movie in which I would tell people that it is OK to be who they are. Although I had no experience, no connections, no money, nothing could stop me from making this movie. My intuition also told me to make a movie about a special education teacher, Kazuko Yamamoto who lives happily with who she is, teaching “gifted” children in Ishikawa, Japan. Not only is she true to herself, but she views fatal diseases and disabilities as treasures. I am sure that she can be an inspiration whose philosophy will move every person’s heart. There are people with disabilities. There are also a lot of people with pain and suffering inside of them. Why are neither people nor the universe perfect? How can imperfect people who live in an imperfect universe live happily? I hope that this movie will touch your heart and help you discover your own “truth”. You love yourself a little more by watching the film. You would appreciate people around you by watching the film. You feel happiness by watching the film. You feel good to be born by watching the film. The spirited film expresses a great power deep in the body by describing how Masanori Minami lives and how Junkyo Ooishi lived. Masanori Minami lost his both arms by an accident in spring recess of his third grade. At that time, he was helping his father, who ran sawmill, and a rolling machine took his arms in. At the age of 14, he made a visit to Junkyo Ooish, nun, with his parents, from an advice of a neighbor. Junkyo had no arms, too. She lost her arms at the age of 17, in the incident ‘Horie Six- People Murder Case’, that her adopted father killed five people. At the age of 19, she learned from watching canary nurturing her babies that she could write and draw with her mouth. Since then she took a brush with her mouth, and practiced to draw pictures and write letters. First of all, you have to come to Kyoto from Sakai, Osaka by yourself. Second, to use your mouth to do things instead of your legs. Third, you will draw pictures. And then training was started under Junkyo filled with deep love. Masanori learned from Junkyo’s way of living how to live passionately without arms. Now he is some painting artist, received lessons from Junkyo. His life is filled with pleasure, surrounded by his wife, his children and many friends. Such a figure gives many people hope. He takes lessens from Junkyo as her last apprentice. He is actually living his life of ‘KAFUKU ICHINYO’, which means that your life can be full of happiness or unhappiness depending upon your own mental attitude. He was born in Osaka prefecture in September 1951. He lost his both arms by an accident in spring recess of his third grade. At that time, he was helping his father, who ran sawmill, and a rolling machine took his arms in. Two years later the accident he started his fourth grade in a special-need school. He devoted himself to training to use mouth, feet and shoulders for study and living. At the age of 14, he started study under Junkyo Ooishi, a sainted artist by mouth. He practiced painting with mouth and learned way of life. 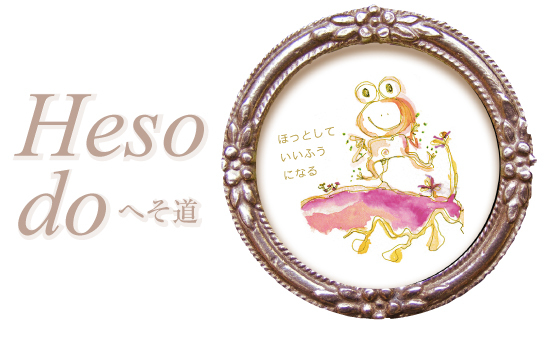 A year later his picture won the first prize as a fresh artist by mouth in Sakai-city exhibition. Since then he repeatedly won prizes and awards in juried exhibition. In 1995 he was assigned as a judge of Sakai-city exhibition. Now he works on mainly solo shows, not exhibition. In 1996 he was assigned as a counselor for physical-disabled persons in Sakai-city. In 1999 he was given a social contribution prize by Japan foundation of soroptimist. Copyright © 2014 株式会社totalpraise All Rights Reserved.